I here Voices. The Voices tell me to cut up Fabric. Good Fabric. Into small pieces. Small interesting pieces. Then the Voices tell me to put them back together again. In interesting ways. Well, I have to admit it. I sure don't blog like I used to. All my friends are on facebook now and we share our stories there, I am really enjoying that format now! I wanted a way to link the two together but am not savvy enough right now to figure it out. 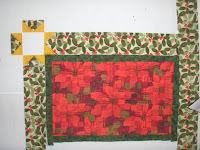 The greatest thing about my blog is that I took the time to categorize my quilts and list them all together so I now have this wonderful catalog of my finished and unfinished projects. I do plan to keep the blog and maybe... someday... I will blog again. I realized that I could practice quilting while laying out my new quilt top, because I really need to lay everything out before trying to piece it all together. 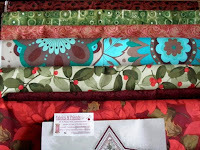 And, I was just itching to start quilting with my new set up. So... for now, I work in tandem! 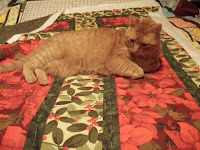 Tucker insisted on laying on the quilt while I was basting! Maybe a quilt is emerging here? My table arrived even with our severe weather! Having some tornado watches today and have been waiting for my table to arrive today ... FedEx reports that the arrival of my table may be delayed... "IMPORTANT! Inclement weather conditions at Memphis hub may cause some service delays and disruptions within the U.S. today." 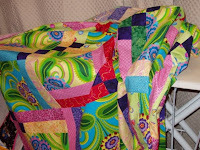 Worked on washing and ironing the new fabric for my new quilt. It is planned to become a true art piece and I am designing as I go. 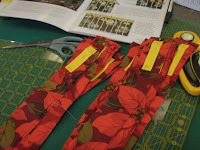 Right now I am "mixing the paint", meaning all the fabric I want to use is washed and mostly all ironed as of tonight. The pallet is nearly ready to start picking from. 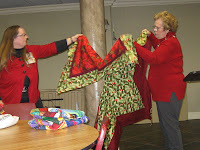 I went to the AQS Paducah quilt show over the weekend and my big purchase is a SewEzi table. It is due to arrive later this week! I was so excited that I went home Sunday and rearranged my sewing room in anticipation of my new table. They are almost done, hopefully I will get some help in the next week to finish them. 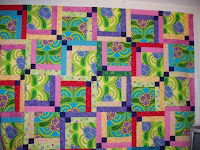 Two are string quilts using some of my scraps and fabric I want use up. 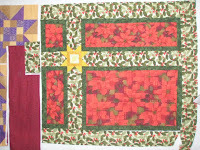 The other two were started a few years ago when our guild wasn't making charity quilts, but I still wanted to make them. Now I have a place to give them to so recently I've been inspired to finish them. 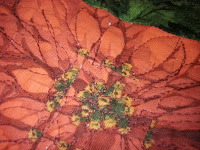 I found this fabric while on Vacation last summer for $4.50 a yard... I bought the whole bolt! 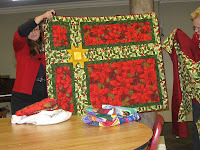 At our annual retreat in November I took a class about making fractured quilts and decided that this was the time to make my first Christmas themed quilt ... ever! 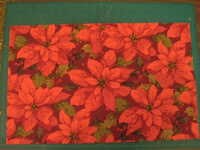 I also decided this because I had just used the same fabric to make a tree skirt. 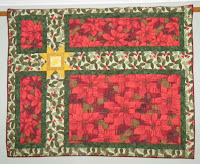 Once it was done I went on to make a table cloth too for our Christmas dinner. Wow! I finished this last summer (2009) just in time for my parent's visit. 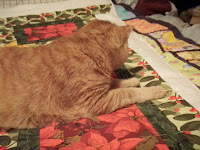 It is a king size quilt that I quilted on my old sewing machine. I've made more progress this year than I imagined! I think I will post from today going backwards. In the last year I've created a lot of new projects, several that will become UFO's. You think the world is quite beautiful, especially if you look at it in new and interesting ways. 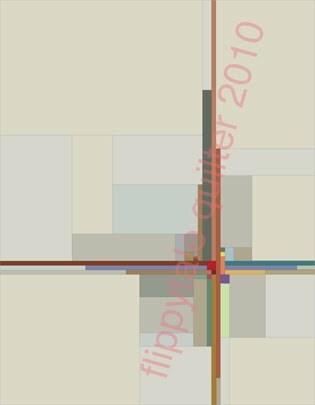 You tend to focus on color and movement in art. For you, seeing the big picture is much more important than recording every little detail. You can find inspiration anywhere... especially from nature. 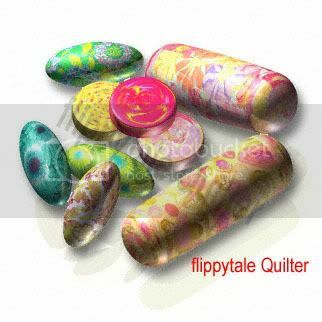 All content of this blog, text and images, are property of the owner, alias "Flippytale", unless other credit is given.